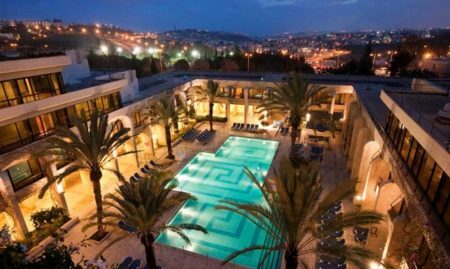 Our tour begins on the Mount of Olives (Har HaZeitim) where we have a panoramic view across the holy city of Jerusalem. From this elevated point we have the ancient Jewish cemetery beneath us and beyond that the Old City with the shining Dome of the Rock on the Temple Mount. As we look down on the Old City it is easy to imagine the Second Temple which once stood on the Temple Mount and the bustling ancient city as it would have been almost 2000 years ago. Then we take the winding road down to the Kidron Valley giving us a view of the Garden of Gethsemane where Jesus was arrested the night before his crucifixion and we also see the Church of All Nations or the Basilica of the Agony. In the valley we can see the ancient burial tombs of Absalom and Jehoshapat, Benei Hezir and the tomb of Zechariah. We enter through the Zion Gate into the Armenian Quarter of the Old City and continue on to the Byzantine Cardo. This was the main street through Jerusalem 1,500 years ago, later under Moslem rule it was left unused and then during the Crusader period the street was once again a busy thoroughfare. Today after extensive excavations, which are ongoing, specialty stores are open where once Crusader stores would have stood. Going through the Jewish Quarter we reach the Western Wall, one of the holiest sites in the Jewish faith. Here Jews from around the world come to pray and put prayer notes between the wall’s stones. This 2,000 year old wall was part of the outer supporting walls of the Temple Mount on which the holy Second Temple stood and was destroyed in 70AD. We continue on to the Via Dolorosa or the Way of Sorrows where Jesus walked towards his crucifixion. Along the way we pause at several Stations of the Cross and finally we reach the Church of the Holy Sepulcher. The basilica is constructed above the place where Jesus is believed to have been crucified and within the church is his burial tomb. The Byzantine church has been renovated, rebuilt and expanded over the years. Today it is a vast and ornate place of worship. 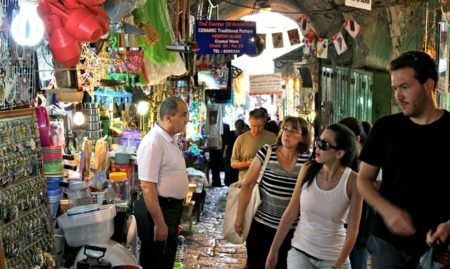 To end our tour we take a walk through the busy markets of the Old City where you can buy unique souvenirs from this special city. 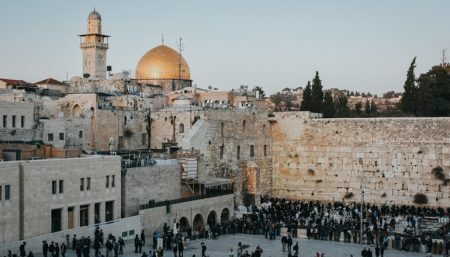 This tour ends in Jerusalem, nevertheless, other drop-off points are available upon request for an additional payment of $65 which can be booked online with your ticket reservation. Change of vehicles is required for transfer of pick up to avoid traffic and delay. What to bring and wear: Modest dress is required for holy places, comfortable walking shoes, water. Guests should bring their own lunch OR purchase lunch for $15 online at time of booking. Price includes all entrance fees. No refunds will be provided for no-shows or cancellations on the day of travel. Cancellations are accepted 24 hours or more before tour begins. Cancellations will incur a 4% commission fee if booked by credit card or Paypal. Have any questions about this tour?